Just a quick update to mention Subtropical Depression 22, which had formed earlier today and has already stopped being tracked by the Hurricane center. Lots of clouds still in the areas, but still nothng ready to form otherwise. There are several areas worth watching in the tropics, but nothing in the short term looks like it will develop. First off, close to home, we have a wave between Cuba and the Keys, referred to as 93L, this is still very disorganized and it is still very unfavorible for development. This one will cause more rain over Florida today. Chances for tropical development of the disturbance off the Keys in the next two days. 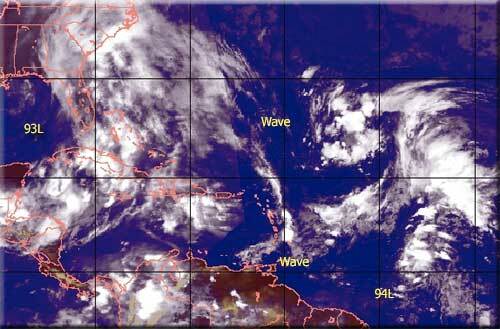 Beyond that there is 94L, which is miles east of the Leeward Islands in the Central Atlantic. This one has a better chance to develop, but still not for the next few days. This one needs to be watched for potential affects on the Leeward Islands, but right now it seems most likely that it will head out to sea before that. Chances for tropical development of the disturbance east of the Leeward Islands (94L). There is another wave over the Leeward Islands themselvs right now, this one could develop over the next few days, but right now it remains fairly disorganized. Chances for tropical development of the disturbance over the Leeward Islands. Another wave in the Central Atlantic Northeast of Puerto Rico This is mainly non tropical right now, and has a very low chance, but it's worth watching. Chances for tropical development of the wave northeast of Puerto Rico. The disturbed area in the Western Caribbean somewhat associated with 93L is still hanging out there, too, and may have to be watched later if it decouples and hangs around there.